Tag line: "Evil Has Been Summonned...Again!" Line from the film: "A week? Is that the best you got? I was once in a hole for 3000 years... this should be a breeze"
While attempting to rob an art gallery, Morgana (Holly Fields) accidentally releases the Djinn (Andrew Divoff), an ancient demon that gains power by granting other people’s wishes, after which he takes possession of their souls. Following a shoot-out with several security guards, Morgana (who doesn’t realize what she’s done) flees the scene, leaving her wounded accomplice / boyfriend, Eric (Chris Weber) behind. The Djinn grants Eric’s dying wish (that he had never been born), so when the police arrive on the scene, they find only the Djinn, who’s taken on human form. Arrested for the crime, the Djinn, using the pseudonym Nathaniel Demarest, is sent to prison, where he finds hundreds of people willing to trade their souls for a wish. Meanwhile, Morgana is being haunted by images of the Djinn, and asks her close friend, Father Gregory (Paul Johansson), a Catholic priest, for help. Together, the two figure out what’s happening and begin looking for a way to defeat the Djinn, who, the moment he’s collected 1,000 souls, will come looking for Morgana to grant her 3 wishes, after which he and his evil minions will take over the world. A sequel to 1997’s Wishmaster, Wishmaster 2: Evil Never Dies isn’t nearly as effective as the original. Aside from the special effects, which are noticeably weaker this time around, the movie suffers from an overall lack of imagination. In the original, the Djinn was “creative” when granting wishes, always finding an ingenious way to twist a person’s wish so it works against them. 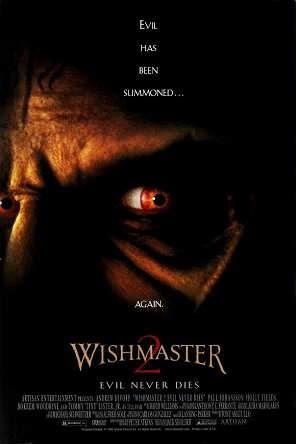 He does the same in Wishmaster 2, but with a lot less flair than he showed in the first Wishmaster; while still in prison, an inmate named Butz (Rhino Michaels) approaches the Djinn and, after threatening him, makes a very specific wish, one I was sure would result in an interesting payoff. Alas, like many scenes in Wishmaster 2, it falls way short of the mark. What saved the movie from being a total failure were the performances. Holly Fields does a fine job stepping into the role of the heroine, but it’s Andrew Divoff who ultimately steals the film. With his strong voice and devilish smile, hinting at the terrible secret his character is hiding from the world, Divoff continues the fine work he did in Wishmaster, bringing to life a dangerous character and clearly having fun in the process. In his hands, what was, for the most part, a disappointing sequel is transformed into a worthwhile experience.